YAOUNDE/ROME, Oct 23 2012 (IPS) - “One in eight people goes to sleep hungry every day,” according to the ‘State of Food Insecurity in the World 2012’, a document released annually by the Food and Agriculture Organisation (FAO). The report goes on to state that 870 million people worldwide are starving, a decrease of 130 million since 1992 but still a far cry from the Millennium Development Goal of halving the world’s hungry people by 2015. As the Committee on World Food Security (CFS) wrapped up its 39th session in Rome on Saturday with the promise to begin a two-year consultation process to “develop principles for responsible investment in agriculture that respect rights, livelihoods and resources”, hopes were high that local and international efforts could really begin to tackle chronic hunger. Meanwhile, amid fears of rising prices on the grain market, the FAO dedicated this year’s World Food Day, celebrated on Oct. 16, to ‘Agricultural cooperatives: key to feeding the world’. Millions of small-scale producers, particularly in the developing world, are responding to the triple crises of climate change, food price fluctuations and market instability by organising themselves into cooperatives to join forces and collectively tackle national and international policy constraints. The FAO sees cooperatives as a major way to lift small-scale farmers out of poverty and hunger, and help them to access markets to sell their products, buy inputs at better prices and obtain financial services. 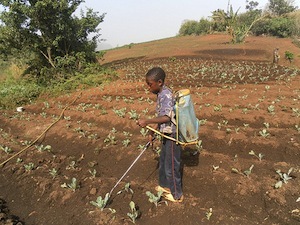 Collins Mangong used to farm a one-hectare piece of land in his native Konnye sub-district in Cameroon’s southwest region. His harvest, most of which came from roots and tubers, was often lost in the post-harvest phase. “I did not have the financial means to improve my farm and (preserve) my harvest,” he told IPS. But in 2008, Mangong, along with some 132 farmers in the locality, came together to form the Ikiliwindi Farmers Roots and Tubers Cooperative Society. Each farmer contributed about 50 dollars as shares, which created a baseline that the farmers used to access bank loans. “Our cooperative now farms on 25 hectares of land,” Mangong added, harvesting and processing the by-products of cassava such as gari flour. The farmers’ yields per hectare have increased dramatically. 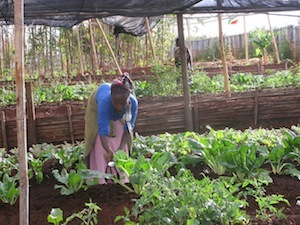 “Having brought our resources together, we are now able to (procure) inputs like fertilisers, and our yield has risen. “At first, I used to get about 1,400 dollars per year by selling cassava from one hectare of land but after we formed the cooperative and I improved my farm I now get two million CFA (about 3,900 dollars) for the same piece of land,” Mangong told IPS. As production and productivity rises, many in the group are finding new ways of making the harvest more sustainable. Selamo Dorothy, a member of the Yaounde-based cooperative and head of the Common Initiative Group for Food Security has found a novel way of transforming cassava. Her group uses gari to make what she calls ‘Gari-Light’ – a fruit-enriched food drink. “We also make our own local spaghetti from tubers like cassava, yams and plantains,” she told IPS. While launching activities to mark this year’s World Food Day, the Cameroon minister of agriculture and rural development, Essimi Menye, made a strong appeal for farmers to come together into cooperatives. “We’ve got the work force. We’ve got fertile land. What we need to do now is to organise our farmers. By coming together in cooperatives, farmers can boost production, get better market access and stand a better chance of negotiating market prices for their produce,” he said. But establishing cooperatives is not always easy. 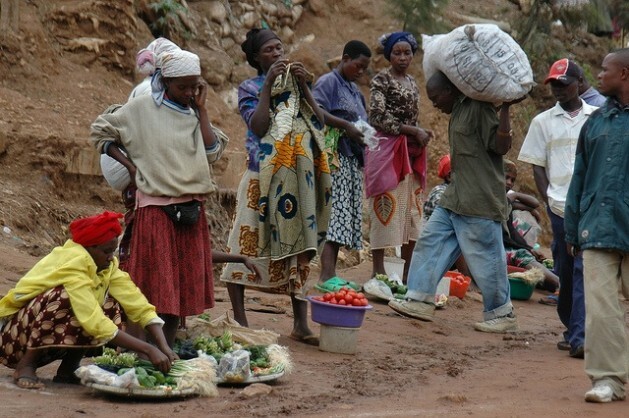 Malawi, one of the world’s least developed countries (LDCs), is being forced to look at short-term solutions to cushion the most vulnerable from the blows of spiraling food prices fuelled by this year’s poor harvest and rising inflation. The headline inflation rate soared to 25.5 percent in August, up from 21.7 percent in July, on account of escalating food prices, which have risen 50 percent in the last few months. Apart from a poor harvest and run-away inflation, increasing global oil prices are also pushing food prices up in Malawi, which hurts the poorest most. “We are looking at agriculture cooperatives as a vibrant and effective long-term answer,” Finance Minister Ken Lipenga told IPS. But in the interim, the government is working with the World Bank to roll out social protection programmes that target the most vulnerable members of society, the majority being women head-of-households, and children orphaned by HIV/AIDS. “In the short term, the social cash transfers and food for work programmes are targeting the poorest who fail to acquire minimum daily food requirements,” Lipenga added. “(The) government has set aside about 94 million dollars (for) rolling out a public works programme, a school feeding programme targeting 980,000 pupils in primary schools, the school bursaries programme targeting 164,800 needy students and a social transfer programme to reach over 30,000 households across the country,” Lipenga said. But individual country efforts will not be enough to tackle the crisis of hunger and poverty on a global level. French President François Hollande called for a high-level meeting on global agricultural governance on the sidelines of World Food Week at FAO headquarters last week to discuss issues of transparency in international agricultural markets; the coordination of international actions; responses to the global demand for food and the fight against ripples effects of food price volatility. Graziano da Silva said important advances have already been made in terms of governance, referring to the recent reform of the CFS; the establishment by United Nations Secretary-General Ban Ki-moon of the high level task force on global food security; and the creation by the G20 of the agricultural market information system (AMIS) to ensure international coordination, information and market transparency. Meanwhile, civil society organisations are requesting that the G20 lay out a road map to urgently address the drivers of price volatility rather than simply responding when crises hit. Recent data from the World Bank revealed price increases of 10 percent on international food markets. Thus, investing in food stocks is but a partial solution that must be coupled with such measures as a revision of the European Union and United States’ biofuel policies, which allow massive tracts of land to be shifted from food to fuel production. “The importance of smallholder farmers appeared repeatedly in the ministerial meeting. Smallholders, and particularly women, should be supported for sustainable food production,” Aftab Alam Khan of ActionAid International told IPS. “The recurrent food price rise demands serious and practical actions to address both national and global food prices,” he said. *Sabina Zaccaro contributed to this report from Rome, Mabvuto Banda from Linogwe, and Ngala Killian Chimtom from Yaoundé.